Some signals can only be observed modulo 2*pi, and this can also apply to two- and three dimensional images. In these cases phase unwrapping is needed to recover the underlying, unwrapped signal. In this example we will demonstrate an algorithm  implemented in skimage at work for such a problem. One-, two- and three dimensional images can all be unwrapped using skimage. Here we will demonstrate phase unwrapping in the two dimensional case. 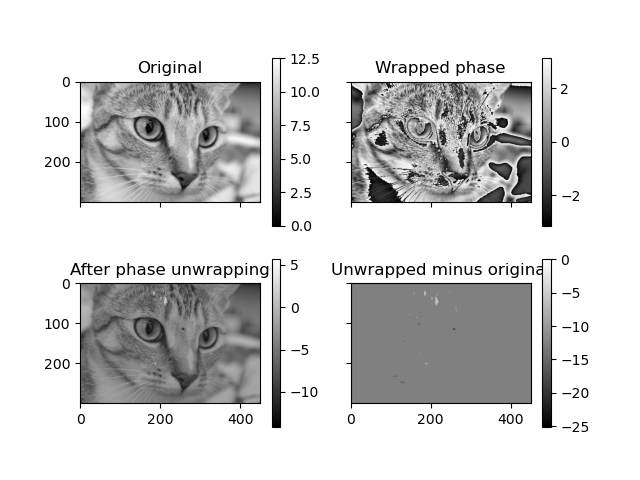 The unwrapping procedure accepts masked arrays, and can also optionally assume cyclic boundaries to connect edges of an image. In the example below, we study a simple phase ramp which has been split in two by masking a row of the image. In the figures above, the masked row can be seen as a white line across the image. 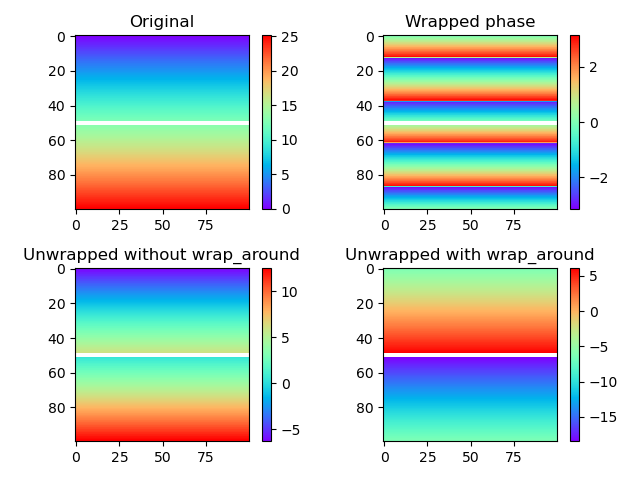 The difference between the two unwrapped images in the bottom row is clear: Without unwrapping (lower left), the regions above and below the masked boundary do not interact at all, resulting in an offset between the two regions of an arbitrary integer times two pi. We could just as well have unwrapped the regions as two separate images. With wrap around enabled for the vertical direction (lower right), the situation changes: Unwrapping paths are now allowed to pass from the bottom to the top of the image and vice versa, in effect providing a way to determine the offset between the two regions.